Medieval Bohemia was a difficult, dirty, violent pace, but that doesn’t mean there wasn’t still time for a bit of romance. That’s the focus of Kingdom Come: Deliverance’s second story expansion, The Amorous Adventures of Bold Sir Hans Capon. In the DLC, you play wingman to the hapless Sir Capon, as he attempts to win the heart of the fair maiden Carolina. Needless to say, this love story will take a few unexpected turns. In addition to all that mushy stuff, you can also take part in the new Rattay Combat Tournament. You can check out a trailer for The Amorous Adventures of Bold Sir Hans Capon, below. The heart of our much-loved young Sir Hans Capon is bursting with overwhelming longing for…his latest flame. 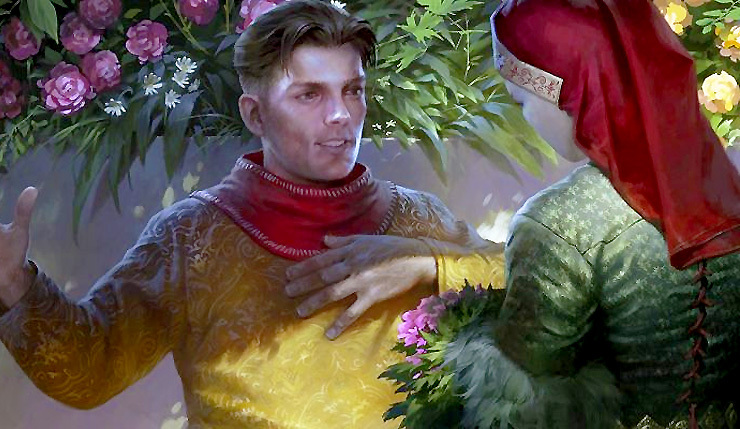 The second DLC, “The Amorous Adventures of Bold Sir Hans Capon” for Kingdom Come: Deliverance revolves around his attempts to woo the fairest maid he has ever set eyes upon, and his success will not depend only on his own mastery of the art of love – it’s also up to his trusty wingman, you – Henry, to ensure that The Amorous Adventures of Bold Sir Hans Capon come to a happy end! That’s the main objective linking three new quests, in which you will not only have to read love poems, arrange a nighttime tryst and keep an enraged butcher at bay, but also infiltrate the camp of a band of bloodthirsty brigands, enter a dice tournament, dig up a corpse, investigate a murder and…er…perhaps commit a few. All for love, of course! Kingdom Come: Deliverance has struggled to keep on top of glitches and other issues since launch, and it’s first expansion, From the Ashes, received mixed reaction, but Amorous Adventures looks somewhat more intriguing. Will the DLC get players all hot and bothered, or just kind of annoyed? We shall see. Kingdom Come: Deliverance – The Amorous Adventures of Bold Sir Hans Capon pitches woo on the PC, Xbox One, and PS4 on October 16.